Posted February 1st, 2016 at 3:37 pm | Log in to reply. Maangchi, I have a “bean” smell growing ever more pungent in my living room. Actually, it is not a bad smell … I kind of like it. There are 3 soybean-bricks sitting on a heating pad drying out. I put the pad and bean-bricks on top of an ironing board to get them up off the floor. Question about the salt – I am presuming you use Diamond Crystal brand of Kosher Salt. How many 3-lb boxes of Diamond Crystal salt will I need to equal 5-qts of salt I need for this doenjang recipe? A couple of notes for anyone else wanting to make doenjang. 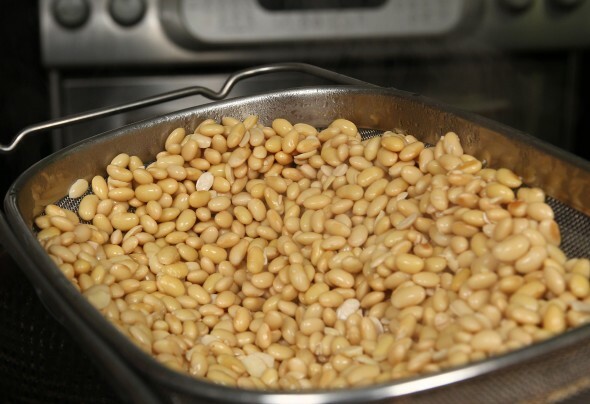 It takes a minimum of an 8-qt pot to soak 5-lbs of dried soybeans. Put the dried beans in it and fill it to the top with water. During the 24-hrs the beans will soak they will be absorbing the water so occasional check the water level to be sure the beans are fully covered. Once fully re-hydrated, the beans will fill the entire 8-qt pot. I opted to use a larger 20-qt canning pot, filled it with water and walked away for a day. I used a 12-qt pot to boil the beans for about 5-hrs. Use a food processor to munch-up the cooked beans. I have an 11-cup food processor, it took 12 passes to process all of the cooked beans. Then smash the beans in a bowl. I used a 1-1/2 inch diameter rolling pin wrapped in food plastic wrap so the wood did not absorb any bean oil or juices. It worked perfectly. You can also use a bar muddler if you have one. The beans squish easily. They are heavier than you think. Each bean-brick weights about 1850 grams (4-lbs). Posted February 2nd, 2016 at 2:56 pm | Log in to reply. You are making doenjang and ganjang! These are good looking meju! Regarding your question, you will need 2 three-pound boxes of Diamond Crystal brand Kosher salt. Good luck! Posted February 4th, 2016 at 7:52 pm | Log in to reply. Maangchi, thanks for the info on the salt. The meju are hanging in the window in a cool room with plenty of circulation. Over the 4 days the meju were on the heating pad they each lost an average of 500g (1.1 lbs) of water. I was going to use wax paper under the meju but at the last minute changed my mind and used parchment paper instead. My thinking was that the idea was to remove moisture from the meju and wax paper is water-proof … will help keep moisture in. The parchment paper was a good choice as it absorbed water and allowed it to evaporate. Posted January 30th, 2016 at 4:32 pm | Log in to reply. What a wonderful video! I thoroughly enjoyed it although I will probably never make it. I use either Japanese miso or Korean doenjang often in soup or vegetable pickling but will probably just continue buying it at my local Asian Market. I can’t admit it to my Japanese wife but I prefer the taste of the Korean product. It seems to be earthier with a richer taste. I am giving my daughter and son-in-law a link to this and they may just try it. He is a kimchi addict who loves your kimchi recipe. Thanks for all your great videos Maangchi. Posted January 22nd, 2016 at 4:05 pm | Log in to reply. Posted January 22nd, 2016 at 10:15 am | Log in to reply. Wow! This video is so good! This is one of the best of your video’s I’ve seen here. Please tell us again, how many of those big Modelo beers did you have? Posted January 27th, 2016 at 11:04 am | Log in to reply. Posted January 22nd, 2016 at 6:26 am | Log in to reply. Can I dry my meju in a dehydrator overnight before hanging it up to ferment? Posted January 27th, 2016 at 10:53 am | Log in to reply. Ima, I don’t know the answer because I have never thought about using a dehydrator. It may be a good idea, but I wouldn’t risk breaking my meju blocks. The blocks may be split. When I make meju, I follow old fashioned methods because if any little experiment doesn’t work, it may cause the whole project to fail or change the taste of my doenjang and ganjang. It’s such a long project, it pays to follow time-honored methods. Posted January 21st, 2016 at 5:58 pm | Log in to reply. My girlfriend has many food allergies, such as gluten, corn, milk, eggs, and yeast. She is also allergic to soy. I was going to try to make a soybean paste from scratch using other kinds of beans. 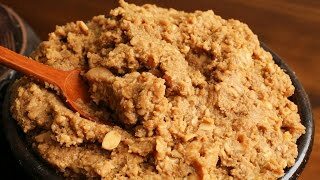 Do you have any advice on any other kinds of beans (or bean combinations) to try, or have you heard of Koreans making non-soybean substitutes before? I was going to start an experiment making a batch each of garbanzo bean, navy bean, black bean, and soybean (to test how the others compare). Posted January 21st, 2016 at 6:20 am | Log in to reply. Thank you for the recipe! I really like recipes like this. I make my own miso as well. Would love to try this one. I was wondering, can you use beans other than soy beans, for example garbanzo beans? Thanks! Posted January 20th, 2016 at 12:29 am | Log in to reply. I have been looking forward to this recipe. I live in Singapore and the average temperature is 28 Celsius. It is a big disappointment for me not to be able to try this recipe. Anyway thank you very much for sharing all your wonderful recipes. My family enjoy many of the recipes. Posted January 20th, 2016 at 7:57 am | Log in to reply. Why not? The catch is the part of drying the blocks when the humidity is too high, not the temperature per se (which would be perfect in your case)! Try a ventilator. Posted January 19th, 2016 at 12:46 pm | Log in to reply. Thank you for your hard work! I was wondering about the hay – Did you wash it to make it clean before you laid the meju on it? If i cannot find rice stalks or hay (i don’t trust the cleanliness of the stalks) can i just use a wire rack instead? Thank you again! Posted January 19th, 2016 at 4:27 pm | Log in to reply. Yes, of course I washed it and dried before using it. I should add the line in the recipe. Posted January 17th, 2016 at 4:36 pm | Log in to reply. Posted January 17th, 2016 at 4:35 pm | Log in to reply. Posted January 19th, 2016 at 4:10 pm | Log in to reply. Posted January 17th, 2016 at 12:54 am | Log in to reply. Posted January 19th, 2016 at 4:04 pm | Log in to reply. Posted January 16th, 2016 at 3:19 pm | Log in to reply. Hi Maangchi! Wow, what a journey for this recipe. Thanks for spending the time to make it and post the video. I have a new appreciation for what it takes to make it. I do have a question though….I bought fermented shrimp, red pepper paste and soybean paste. How long do these keep in the refrigerator once they are opened? Posted January 19th, 2016 at 4:02 pm | Log in to reply. Fermented shrimp won’t go bad until it runs out. Red pepper paste and soybean paste will last for a long time, too as long as you keep them in the fridge. Posted January 16th, 2016 at 9:56 am | Log in to reply. I live in Indonesia and it’s quite hot & sunny where I live. Can I still try to make doenjang? can I dry my menu in the sun? Posted January 19th, 2016 at 4:00 pm | Log in to reply. I’m not sure if it will work or not but if you make it indoors and control your room temperature to 20 celsius it should be fine. Posted January 16th, 2016 at 1:05 am | Log in to reply. Posted January 19th, 2016 at 3:53 pm | Log in to reply. Thank you so much for your interest in my recipes! Good luck with your Korean cooking! The video was watched 1,777,264 times on YouTube & has 26,227 likes!